Info: This feature requires Enterprise Server version 9.4.5 or higher. During the process of importing content types from Drupal 7 as Publish Form templates, tables and properties are added to the database in Enterprise Server. If at some later stage the imported Publish Form templates are removed from Enterprise because they are not needed anymore, the columns and properties still remain in the database in Enterprise. It is therefore advisable to clean up the Enterprise database by following the steps that are described here in this article. Step 1. Unpublish all stories that were published using the template. Tip: Use the Publish Manager to quickly unpublish multiple stories in one action. Step 2. Access the Dossier(s) that were used for publishing the stories and remove the Publication Channel in which the template was used. In the Dossier, hover the mouse pointer over the name of the Publication Channel in the Publication Channel pane and click the Trash Can icon. During this step, the Publish Form that was used for publishing the story is automatically moved to the Trash Can. Before the Publish Form template itself can be removed, all Publish Forms that are based on it first need to be removed. Step 3. Access the Trash Can, locate the Publish Forms and permanently delete them. Tip: Set the Filter to look for files of type 'Publish Form'. Step 3a. On the Home page of Content Station, double-click the Trash Can icon in the Applications pane. The Trash Can page appears. Step 3b. Locate the removed Publish Form and select it. Step 3c. Click the Delete icon in the toolbar and confirm that you want to permanently delete the file. Step 4. Use the Search feature of Content Station to locate the Publish Form template that needs to be removed. Tip: Set the Filter to look for files of type 'Publish Form Template'. Step 5. Right-click the template and choose Move to Trash Can. Step 6. Access the Trash Can, locate the Publish Form templates and permanently delete them. Step 6a. On the Home page of Content Station, double-click the Trash Can icon in the Applications pane. Step 6b. Locate the removed template and select it. Step 6c. Click the Delete icon in the toolbar and confirm that you want to permanently delete the file. Note: This step will remove the content type from Drupal. This step is optional and does not necessarily have to be performed. However, when the content type is not removed, it will appear again in Content Station in the list of templates to choose from as soon as content types are imported into Enterprise again. Step 7. Click Structure > Content Types. Step 8. Click Delete for the content type that needs to be deleted and confirm the action. Step 9. 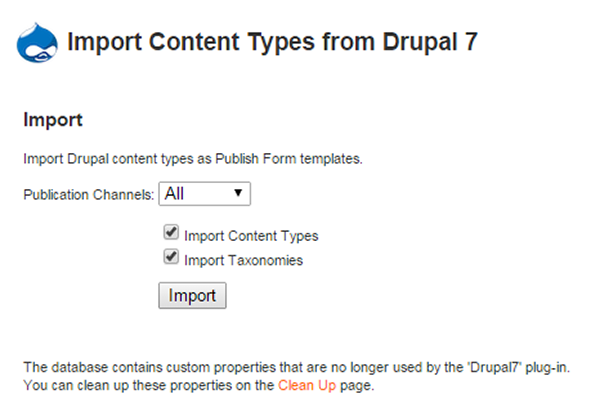 Import the content types from Drupal 7. Step 9a. Access the Drupal 7 Maintenance page in Enterprise Server. Troubleshooting: why does Drupal 7 not appear on the Integrations page? The Drupal 7 icon is only available on the Integrations page when the Server plug-in "Drupal 7 - Publish Forms" is enabled. For more information, see Integrating Drupal 7 in Enterprise Server. Step 1b. Click Drupal 7. 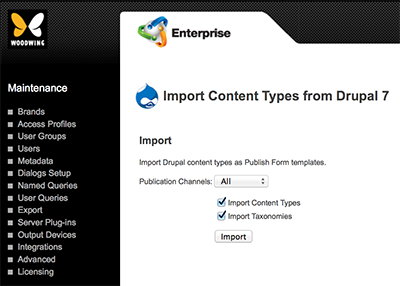 The "Import Content Types from Drupal 7" Maintenance page appears. Step 9b. (Optional and only available in Enterprise Server 9.3 or higher) From the Publication Channels list, choose the channel from which you want to import. Step 9c. Make sure that the check box for importing content types is selected (only available in Enterprise Server 9.3 or higher). Enterprise detects that custom properties are present which are no longer used and shows a message. Step 10. Click the link named Clean Up Server Plug-in Custom properties. The "Clean Up Server Plug-in Custom properties" page appears, showing an overview of the database objects that are not used anymore. Tip: Click Show to show the details per database table. Step 11. Click Clean Up and confirm that you want to start the process. When the process is completed, the final result is shown.